The term "Low Key" in photography refers to a style of image that uses dark tones and bright highlights to illuminate part of a subject to achieve a dramatic effect with shadows or dark spaces in the image. 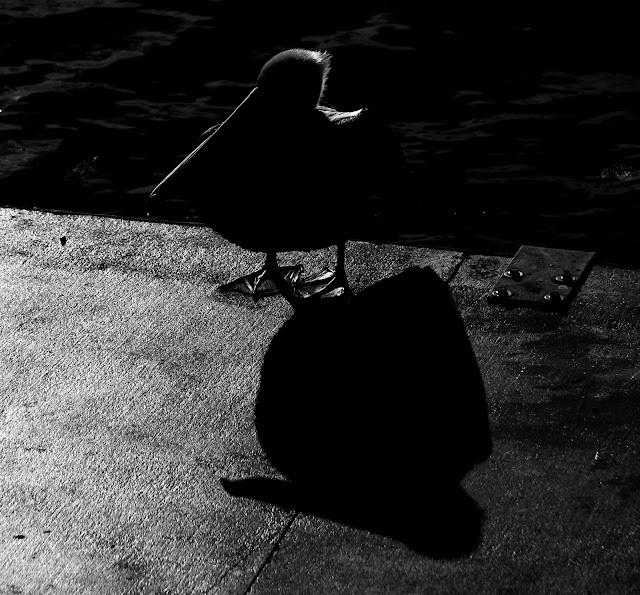 Normally, you don't want the sun behind a darker bird like a brown pelican, but I decided to roll with it and do this in Low Key black and white and it reminded me of the portly shadow of Alfred Hitchcock at the start of his old TV show. Now try and get that intro music out of your head....da DUM...da da da da dum da dahhh...da DUM...da da da da dum da dahhh. Yeah, I know, been humming it all day; sorry to do it to you. he does look a bit sinister - and of course the music is going around my head! I yet to have an image for this theme but I can't spend a lot of time thinking about it because my mind is on Alfred Hitchcock ... thanks a lot. Interesting interpretation of this subject.